Dried beans are usually the frugal choice since they're inexpensive and easy to store. Use them in place of canned beans, and you won't even have any cans to recycle or throw away. If you have limited storage space, you'll also find that dried beans are a great space-saver. Perhaps the only hurdle to using dried beans is that you have to know how many to use when a recipe calls for a specific number of cans or cups of beans. 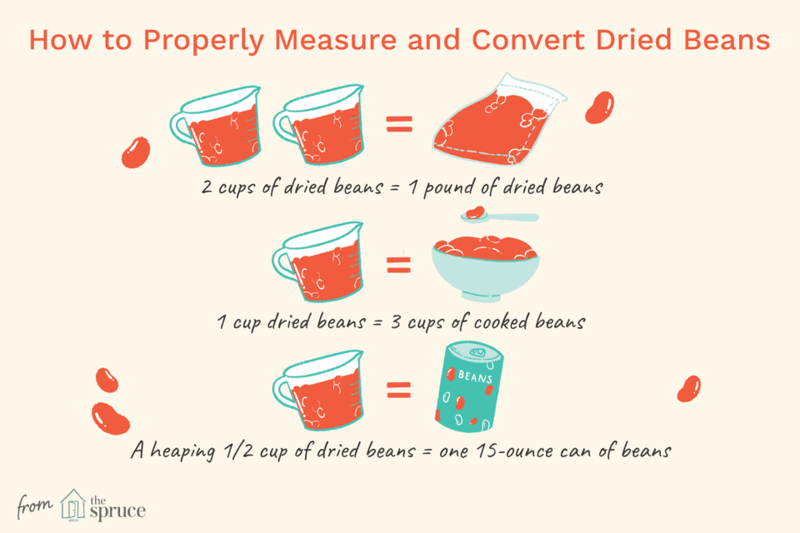 Use these instructions to measure dried beans properly. While a great starting point, these rules of thumb vary based on the size of the bean. Larger beans yield less when cooked, while smaller dried bean varieties give you more yield when cooked. You should take this into consideration when you are making a recipe for which you need exact amounts of beans. You may have to cook the dried beans, then measure them to add to the rest of the recipe. Most bean recipes are fairly forgiving and adjustable. But if you're attempting to have just the right balance in a three-bean salad or pot of mixed bean soup, you might need to make some adjustments. If your recipe called for pinto beans, but you only have kidney beans, is it OK to make a substitution? Beans are interchangeable in many recipes. Just know that it may alter the color and flavor of your dish somewhat. However, you should avoid making substitutions in recipes like refried beans, hummus, or any dish where beans are the main ingredient. You probably won't be as happy with the result. Dried beans cost far less per pound than canned and can be stored for a year or more. However, soaking and cooking dried beans does take time. This is something you need to factor in when considering the overall cost. Expect it to take anywhere from 30 minutes to two hours to cook a batch of beans. Times vary depending on the variety. If you're not sure how long to cook your dried beans, consult our handy list, based on recommendations from the U.S. Dried Bean Council. It has excellent, specific instructions for cooking a variety of different dried beans.